Stuart Barnes has spent over forty years of his life immersed in rugby union, remembered as one of the most controversial playing names during the dying days of the English amateur era and now regarded as a controversial observers in the media - on both television and in print - with over two decades of broadcasting and journalistic experience to draw upon. Sketches from Memory combines autobiography with an objective and off-beat study of the sport from the author's childhood in the 1970s, through the revolution of the transition to professionalism in the 1980s and 1990s, right up until the present day. Eschewing the more traditional form of the sports book, Barnes abandons chronology to allow past and present to mingle, presenting his memoirs as an alphabetical soup with the letters of the alphabet and not the numbers, dates and years of his life leading the narrative. It is a refreshing, beguiling and absorbing approach that allows the dedicated reader to complete the book in sequence, or the bed-side reader to flick from one letter to the next without losing the thread. 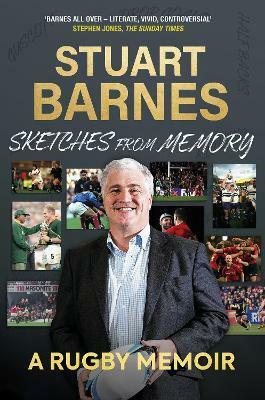 Honest, insightful, funny and wise, Sketches from Memory is a fascinating study of the game of rugby union, exploring its myriad enchantments, controversies and world-famous characters like no other book has done before. Stuart Barnes won ten caps for England before becoming the face - and voice - of rugby union on Sky Sports in 1994, where he continues to work today. An author of three books on rugby (Rugby's New-Age Travellers was the runner up in the William Hill Sports Book of the Year award in 1997), he has written for a range of publications including Rugby World and the Telegraph and is a regular columnist for The Times and Sunday Times.